The more I think about it, the more I realize that The Grand Budapest Hotel just might be one of my favourite movies of all time. Director Wes Anderson's attention to detail and the incredible amount of thought and care he put into every frame of this movie creates an experience you just don't see with many movies anymore. This post will discuss just one method (of many) that Anderson uses to enhance his story: aspect ratio. Aspect ratio, very simply, refers to the ratio of the width to the height of a movie screen. Where movies are almost always presented in one aspect ratio, The Grand Budapest Hotel is actually presented in three. The movie is essentially a story in a story in a story in a story, with each story taking place in a vastly different time period. 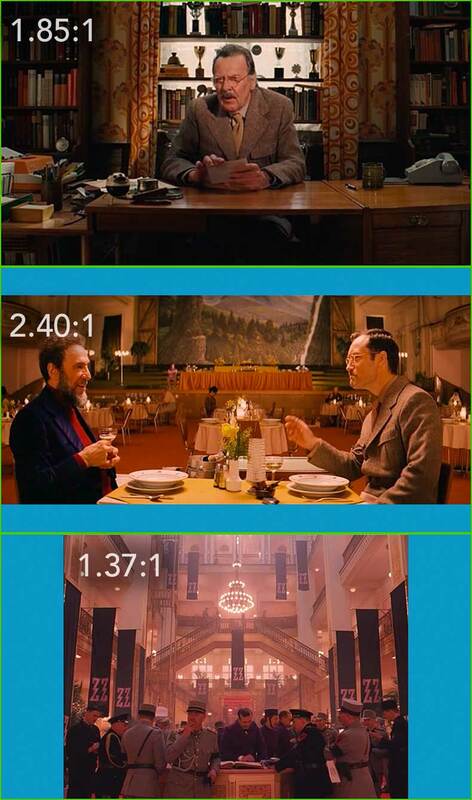 To reflect the cinematic traditions of each of the different time periods in the movie, Wes Anderson uses the aspect ratio most representative of that specific time period. For example, the scenes at the beginning and end of the film take place, more or less, in the present and the aspect ratio Anderson uses, 1.85:1, reflects this. The 1.85:1 aspect ratio is the most common ratio for modern film and therefore looks the most familiar to us. When the movie goes further back in time to 1968, as the Author meets and has dinner with Zero Moustafa, the aspect ratio changes to 2.40:1. This widescreen format was used widely in the 1950s and 1960s. As Zero tells the story of how he came to work at the Grand Budapest Hotel as a protégé of Concierge Gustave H. and the story is transported back to 1932, the aspect ratio changes again. It changes, this time, to 1.37:1, the so-called 'Academy ratio' that became the studio standard in 1932. This ratio nicely complements Anderson's style and his penchant for symmetry that can be seen in almost every shot of the film. While there is far more that can be discussed with this movie, I was particularly interested in Wes Anderson's use of aspect ratio because it's something that I think most viewers (myself included) wouldn't think of as a narrative tool. Anderson uses aspect ratios to add another layer to his story, paying homage to classical film techniques while at the same time creating a sense of historical authenticity. I don't really have too much else to add other than to encourage you wholeheartedly to see this film. It really is a work of art and each frame is essentially a painting come-to-life. See more of my writing here at my personal blog.